Years ago, when I was working as the office manager for a small company, I wanted to buy a house with my fiancé. We didn’t have any money saved for a down payment, and we didn’t know how we could do it, but we set the goal anyway. Right after that, the company I worked for sponsored a class called Hypmovation—it was a combination of self-hypnosis and motivation. The goal-getting idea I got from them was to write a contract with yourself, identifying specifically what you wanted and by when. You were to describe in the contract the actions you would take to achieve the goal and then sign and date it. After that, you were to visualize the goal as a reality, and follow through by doing the actions you said you would do to accomplish the goal. I wrote that I would open a special savings account labeled “House Account” and save a specific amount of money every week plus any raises I received. I expected that it would take two years to save enough for a down payment on a house. I had never thought about buying a house with partners. The idea presented itself because we had set a goal and were taking positive action to achieve it. Every day, we thought positive thoughts, visualizing owning our own home. Then we took action: We looked at real estate, talked to people, and educated ourselves. We counted our money, adding up the dollars that we saved every week in our “House Account.” I got a raise…and then I got a house! I only owned 25 percent of my first home, but it was a start. When my fiancé and I broke up, I bought out his 25 percent interest in the property. When my partners and I sold it, I had a sizable down payment with which to buy a house on my own. An attorney I knew wanted to own his own home. The home he wanted was in the $500,000 price range. He refused to settle for something smaller in order to get started. He didn’t want partners. He didn’t want a fixer-upper or a more distant location. He had “yeah, buts” for every suggestion. That was fifteen years ago. He still doesn’t own a home. I studied the research in the book “Women Don’t Ask: the High Cost of Avoiding Negotiation and Positive Strategies for Change” by Linda Babcock and Sara Laschever, investigating the reasons why women still make on 77 cents to a man’s dollar – even when they are just as skilled, just as talented, and have the same qualifications and credentials in every way. People Love to Give You Money! Would you like that to be true for you in 2019? It’s incredibly moving to help people redesign their financial habit patterns from the inside out so they can make their goals happen now. I’ve been teaching my 8-week Financial Stress Reduction® workshops & teleclasses for over 25 years and have licensed FSR Coaches across the country. 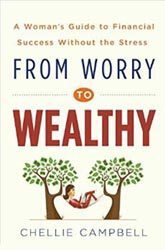 My books “The Wealthy Spirit”, “Zero to Zillionaire” and “From Worry to Wealthy” are published in 7 countries and 6 languages. My teleclasses are small mastermind groups of 6-8 people dedicated to living a rich and happy life. Everyone gets personal attention and guaranteed results! For more details click here https://www.chellie.com/financial-stress-reduction-telecourse-information/ Or just call Chellie NOW 310-476-1622 for your free assessment and consultation!